AVG, the name is known for antivirus products and has been around us since 1991. AVG is known for its top-notch PC security software. AVG Technologies was working independently until it was bought by Avast Software in July 2016. Apart from antivirus products, AVG does have a VPN service that you might not be aware of. This VPN service is known as AVG Secure VPN and is similar in functionality to Avast SecureLine. VPN stands for Virtual Private Network which is an extension of the private network across public networks. This security technology is handled by the VPN server which is located at a remote location. On using a VPN all of the internet traffic generated on the user's end gets encrypted and passes through the ISP's server to reach the VPN server where it gets decrypted. Thus VPN provides us a secure tunnel to use the internet. The main function of a virtual private network server is to encrypt the internet traffic so that no one can see what you were searching or what websites you were visiting. On using VPN even your ISP can't know about your online activity. Why VPN Is Essential In 2018? In 2018, we will be consuming more internet data. Whenever you make a search on the internet then that information will go to your ISP's DNS server which will show you results for that search in return. So your ISP knows everything you do on the internet. Your ISP keeps that information for years and may make a profile of you based on your searching habits. They can actually sell your data to third parties. However, if they somehow don't sell your data the risk of a data breach will always be there. So, if you don't want your internet history to be recorded by your ISP or any other websites then you should use a VPN. A VPN hides your original IP address and assigns you a private IP address. The same address is used by many other users who use the same service. So, your original identity gets shielded and nobody can track you with that private IP address. It is not just limited to hiding your original IP address. With a VPN you can unblock websites that are not available in your country. Easy to use and simple interface. Cheap VPN service and available separately for Android, Mac, Windows, and iOS. Allows P2P networking (torrenting) but only in Windows 10 and Mac. It uses Bank-grade encryption for encrypting the internet traffic. The Windows and the Mac version comes with a 30-day trial period which is enough to test it and decide whether to buy it or not. Also comes with a 30-day money back guarantee but not sure about Android and iOS apps. Because for an active trial you need to purchase it and you can cancel the service anytime during the trial period. The trial period is 7 or 14 days depending on your purchase. Doesn't provide a multi-platform license. So, one license will be valid for one device only. Doesn't have many servers. Most VPN servers are US-based. Almost no settings to configure the VPN. Not a good choice if you want to secure more than one device with a single license. 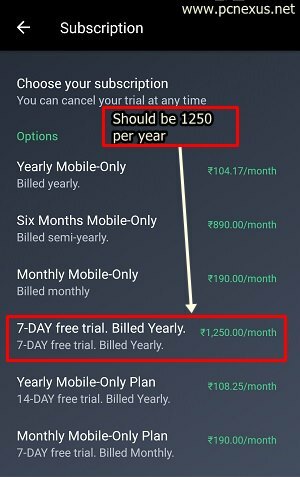 For Android and iOS, you have to purchase the service for starting your trial. You can cancel anytime during the trial period though. AVG Secure VPN for Android costs around $20 for a year. The same service for Mac and Windows 10 costs around $59.99 a year in the US. However, the price will be different in different countries. In developing countries, the price is as low as $37 a year for Windows 10. Price list for Android is given below. Should You Buy AVG Secure VPN? You should only buy this VPN service if you want a cheap and easy to use VPN. If you want to secure only one device then go for this. If you are okay with its 30 VPN servers then you can buy it. 30 servers are technically enough to provide you online security. If you want a multi-platform VPN service then you can just make a Google search to find one. You can read more about a multi-platform VPN named ExpressVPN. Does AVG Secure VPN Secures Against DNS Leak? When your VPN fails to encrypt your device's DNS queries even though the rest of the internet traffic is encrypted then this situation is known as DNS leak. If the DNS gets leaked then your ISP can see your browsing history. At this point, there is no use of using a VPN. But actually, this is a browser related issue. The DNS leak issue is most common with browsers that use WebRTC. Examples of such browsers are chrome and firefox. We tested many servers of AVG Secure VPN and found that none of the servers were leaking our DNS requests. But we didn't test all the servers. So it doesn't matter which VPN you are using you may see DNS leaks. To test for DNS leaks simply follow the steps below. Connect to any VPN server in the app or client. Let it check for DNS leaks. If after the analysis you see your real IP address and ISP name on that page then your VPN is leaking your DNS requests. If you don't see your real IP address then your internet traffic is totally encrypted without any DNS leaks. You can test multiple servers of the same VPN to check which are leaking your device's DNS requests and which are not. Download and install the app from this Google Play Store link. Open the app and tap 'START FREE TRIAL'. Scroll down and select either a 7-day or a 14-day trial plan. Whatever plan you choose you will be billed for that on your payment method. But don't worry you can cancel the subscription in your Google Play account and take refund before the trial period ends. I used a voucher that AVG Technologies sent me for activating my VPN service. The activation was quick and is valid for a year. After activating the subscription you will see the main app screen with a red button in the center. Below you can see an option to change the VPN server location. You can choose your favorite server from the list of 30 locations worldwide. Just tap the red button to activate the VPN. To check for DNS leaks go to ipleak.net. Tap the 'Settings' icon in the top right corner. Here you can see your 'Subscription' details. Make sure 'Auto reconnect' and 'Unsecure Wi-Fi notification' is enabled. Tap 'Data settings' to disable third-party analytics and crash reporting. You should disable these options if you don't want to share your app usage details. Download and install the AVG Secure VPN software for Windows 10 from this link. After installing the software open it. You will see the main software screen like this below. Click 'Change location' and select a location of your choice. You can also select P2P servers for torrenting. After selecting the desired server click the large grey button to enable the VPN connection. There are no settings to configure in the Windows version of this VPN client except for auto connect for unsecured Wi-Fi networks. The AVG Secure VPN works with just one click or one tap. The entire process is secured and automated. After installing the VPN software you can use it for 30 days. AVG Secure VPN is an easy to use and unlimited VPN. If you are looking for a cheap VPN solution for a single device then AVG Secure VPN is a considerable option. When we talk about a VPN then talking only about the list of servers would not be fair. For a VPN to be called best or excellent one should know about its logging policy, its encryption techniques, customer support, refund policy, and price. AVG Secure VPN passes all these aspects. It is cheap, comes with 30-day money back guarantee (PC/Mac only), and doesn't log your data. And the service can be bought for just $20 yearly in most developing countries. $20 a year is not a high price for securing your online privacy on your Android phone. The only major problem with AVG Secure VPN is that it is currently not coming as a multi-platform service. So if you have more than one device like phone, PC, and Mac computer then you have to buy it separately for all these three devices. In this case it won't be considered as a cost effective VPN service. This VPN is good only if you want to save money and secure a single device. Because there is no point of buying a multi-platform license from any other provider if you want to use it on one device only.